Download the latest version, read FAQs or contact us if you need more help. A Device Editor with an on-screen GUI (graphical user interface) providing visuals of your Strymon pedal(s) and all the effect parameters for you to adjust and manipulate. A Preset Collections window on the left listing your own custom collections or groups of presets. Use Ctrl/Cmd+1 to toggle the Preset Collections window on/off. A Device Details window on the right with information on your connected pedal(s) including a Preset Table listing the presets in the memory banks of your pedal, and a Device History window that can be used to revert to previous changes you made in the software. Use Ctrl/Cmd+2 to toggle the Device Details window on/off. How do I start the Strymon Nixie program? 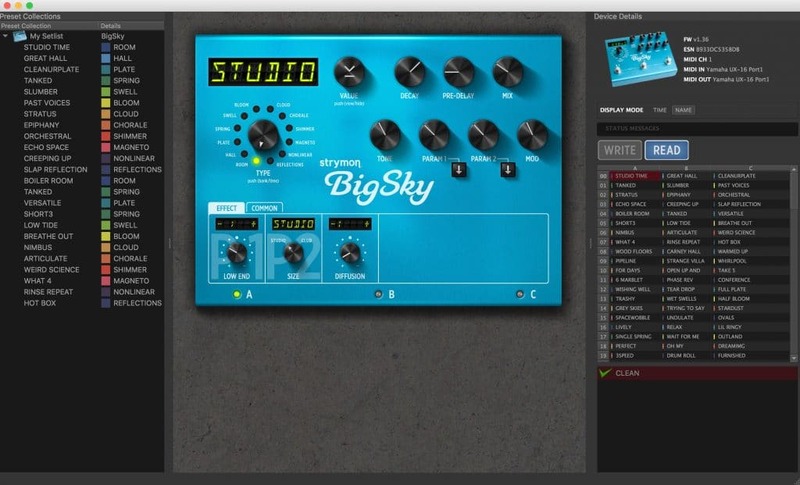 Once you launch the program, Nixie will show its splash screen above, then, will automatically detect any Strymon pedals connected via MIDI and fetch it’s presets to show in the Device Details window in the application. Are my Strymon Pedals compatible with Nixie? Nixie will automatically prompt you to update the firmware on your attached TimeLine, BigSky, or Mobius to the latest firmware version if the program detects that your pedal requires an update. How do I connect my Strymon pedal(s) to Nixie? To connect your Strymon pedal to the Nixie software, you need a MIDI interface to connect from the MIDI IN and MIDI OUT ports of your pedal to your computer, typically through USB. There are many type of MIDI interfaces out there, but we recommend a robust MIDI interface that uses dedicated drivers to operate reliably with your computers specific operating system. We do not recommend getting a plug-and-play MIDI interface as we have seen many of those have trouble with handling the data transferred between the pedal and your computer. Two MIDI interfaces that we recommend are the Roland UM-ONE and the Yamaha UX-16. First, make sure to connect your MIDI interface to your computer and and ensure any required drivers are installed on the system to operate correctly. 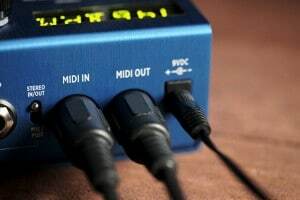 Connect the MIDI IN port of your MIDI interface to the MIDI OUT port of your Strymon pedal. Please keep in mind that some MIDI interfaces have cable ends that tell you where to connect them to such as the Roland UM-ONE. For these interfaces, ‘TO MIDI IN’ connects to the MIDI IN port of your pedal, and ‘TO MIDI OUT’ connects to the MIDI OUT port of your pedal. Set MIDI PA and MIDI CT in the GLOBLS menu of your pedal(s) to ON. Set MIDI TH to MERGE. For pedals with older firmware, set MIDI TH to ON. Set MIDI ST in the GLOBLS menu of your pedal to OFF. Launch the Nixie application and your connected pedal(s) will be automatically detected. Can I connect multiple Strymon pedals to Nixie? You can connect 2 or more Strymon pedals to the Nixie software at once by chaining the MIDI IN and MIDI OUT ports of the pedals together. Start by connecting the MIDI OUT of your MIDI interface to the MIDI IN port of the first pedal in the chain. Connect a loose MIDI cable from the MIDI OUT port of the of the first pedal to the MIDI IN port of the second pedal. Finally, connect the MIDI IN of your MIDI interface to the MIDI OUT port of the second pedal in the chain. ***When connecting more than 1 Strymon pedal to the Nixie software using the same MIDI device/port, make sure that the following settings are made within the GLOBLS menu of each pedal in the chain. Press and hold down the VALUE encoder button on each pedal to access the GLOBLS menu. MIDI TH (MIDI Through) must be set to MERGE. MIDI CT (MIDI Continuous Controller) and MIDI PA both must be set to ON. MIDI ST (MIDI State) must be set to OFF. When multiple pedals are connected to Nixie, the pedal currently being edited will have Device Focus. This is indicated in the Device Editor pane by a dark horizontal bar above the pedal that is in focus. The pedal with Device Focus will also appear in the Device Details window. To be certain you are actually editing the pedal that you think you are editing, you can click the pedal icon in the Device Details window, and the display on your pedal (as well as its representation in the Device Editor window) will flash. In addition to simply clicking on the desired device in the Device Editor window to select Device Focus, you can use keyboard shortcuts to select the device that has focus, as well as change the view. 1 key: Maximum. In-focus device is maximized. Press 1 again to shift focus to another device and maximize. 2 key: Arrange Horizontally. All devices are arranged horizontally at the top of the Device Editor Pane. Press 2 again to shift focus to another device. 3 key: Cycle Arrangement. In-focus device is maximized and other devices are arranged horizontally above. Press 3 again to shift focus to another device and maximize. Ctrl+1: Device Editor for 1 pedal is maximized. Other connected pedals are behind the current pedal. Ctrl+2: Device Editor for each pedal is arranged at the top of the screen. Ctrl+3: Switch Device Focus between the connected pedals. Why doesn’t Nixie see my connected pedal? Can I use Nixie without a Strymon Pedal connected to the software? If you do not have a Strymon pedal, or if you simply want to explore Strymon pedals that are not currently connected to Nixie, you can use Offline Devices create and edit new presets or preset collections. NOTE: An Offline Device allows you to explore the presets and settings of Strymon pedals that are not connected to the software, however, they DO NOT generate audio. To audition the sound you dial in with Nixie, you must have a Strymon pedal connected and use the audio INPUTS and OUTPUTS as you normally would to hear the changes you make to the pedals. Go to Device >> Offline Devices, and select Offline TimeLine, Offline Mobius, or Offline BigSky. When you create an Offline device, this will be noted in the Device Details window in the Nixie software. Also, as there is no Strymon hardware when using an Offline device, there is no WRITE button to save the settings to hardware. You can use the SAVE button to save the presets of this Offline device as a new Preset Collection on the left side of the software. You can also save individual presets to a collection by dragging them from the Preset Table on the right to the Preset Collections window on the left. How do I update the firmware of my Strymon pedals with Nixie? When the Nixie software first detects a pedal that requires a firmware update for compatibility with Nixie, you will be prompted to update the firmware. Download Nixie here. To check for available firmware updates at any time for a pedal connected to Nixie, select Firmware Update from the Device menu. If multiple pedals are connected to Nixie, this will be the pedal with device focus. NOTE: Clicking Firmware Update will erase all items from the History Pane for all currently connected pedals. An Auto Save for each pedal will be automatically created in the Preset Collections window. The Auto Save includes all changes that have not yet been written to the device, but will not include the undo history. How do I back up and restore the presets for my Strymon pedals? Connect the MIDI input and output of your pedal to your computer with a MIDI/USB interface, and launch Nixie. As soon as Nixie has detected your device (and any necessary firmware update has been prompted and completed), all your presets will be automatically backed up. If you have connected a device to Nixie but the device has not been detected, click the Detect Hardware button in the Device Details window on the right side of the screen. Once the device has been detected (and any necessary firmware update has been prompted and completed), all your presets will be automatically backed up. ***NOTE: Clicking Detect Devices will erase all items from the Device History window for all currently connected pedals. At any time while your device is recognized by NIXIE and is in focus, select Backup Presets from the Device menu. Your presets will be backed up to the default location on your drive. This backup is instant and you will not see that anything has happened. Select Show Backups from the Device menu. You will be taken to the folder location where the backups are stored on your computer’s storage drive. From the Device menu, select Restore Presets. A Restore From File window will open, showing all the backups you have made of the current device, identified by date and exact time. Click on the desired backup and click OK.
Click the WRITE button to write the presets to the device. Select Show Backups from the Device menu. You will be taken to the folder location where the backups are stored. Open the appropriate folder (BigSky, Mobius, or TimeLine). Inside you will find a folder named with the ESN (electronic serial number) of the current device. This will match the ESN number in the Device Details pane for your pedals. If you have backed up more than one device of the same type (such as two different BigSky units), you will see folders for both, each with a corresponding ESN folder name. Make sure you open the folder with the same ESN shown in the Device Details pane, unless your intention is to load a backup from one device into a different device. Drag the desired backup file into the Preset Collections pane. Drag the backup folder from the Preset Collections pane to the first slot (slot 00A) in the Preset Table. Click Ctrl+Z (Windows) or CMD+Z (Mac) until you are back to the Clean state as shown in the History pane, OR, simply click on Clean in the History pane where it is shown somewhere above the Restore entry. Then click the WRITE button. How do I manage my presets with the Preset Table in Nixie? The Preset Table is located in the Device Details window on the right side of the Nixie software and lists the presets within the memory banks of your Strymon pedal. The WRITE button is used for saving the changes made in Nixie to your pedal’s memory. The READ button is used to load the presets from your pedal’s memory, clearing out any changes made in the software. Think of the Preset Table as a workspace or staging area. Nothing is ever actually written to the pedal until you click the WRITE button. You have endless Undo via the History pane, and no matter what, the backup that was automatically made when Nixie detected your pedal (and any backups you made since then) will remain untouched. The preset currently being edited will be highlighted in RED. The names of any presets that have been changed from the saved state of the pedal will appear in italics. Presets that have been changed or modified in any way and not yet written to the device’s memory will appear highlighted in green when the focus is not on this preset. Hover over a preset to see its Effect Type displayed next to the cursor as well as in the lower left of the Nixie window. To rename a single preset, double-click the preset in the Preset Table, type in the new name, and press the Enter key. To rename multiple presets simultaneously, you can right/control+click a group of selected presets to select Name Transforms for either adding a suffix to these presets or naming them with a sequential number after the name. Select all the presets you want to rename in the Preset Table. Right-click within the selection and hover over Name Transforms in the pop-up menu, and click Sequence Names. Type in your desired base name, and click OK.
Right-click within the selection and hover over Name Transforms at the bottom of the pop-up menu, and click Suffix Names. Type in the desired suffix, and click OK.
Right-click on the desired preset in the Preset Table and select Copy. Select Paste Insert to paste your preset to the desired location while moving the preset previously at that location, as well as all subsequent presets, up one preset slot. Right-click on a single preset in the Preset Table and select Copy. Select all the locations you would like the preset to be copied to by clicking and dragging, shift-clicking, or ctrl+clicking. The selected presets will be highlighted in RED. Right-click on any selected (RED-highlighted) preset and select Paste Replace. How can I edit the settings of my presets with Nixie? Turn a knob on your Strymon pedal and its corresponding value updates in the Device Editor GUI in real time. You can adjust any of the controls available in the software to dial in the sound you desire on your connected Strymon pedal. In the Device Editor, the Value Knob is actually a value view/hide button. Click the Value Knob to show or hide all the per-preset PARAMS. When the PARAMS values are shown (Device Editor is not collapsed to hide the parameters), you will see two tabs at the bottom of the Device Editor: an Effect tab and a Common tab. The Effect tab includes all parameters specific to the effect type (specific to the Reverb Machine, Modulation Machine, or Delay Machine) currently selected by the Type Knob. The Common tab includes the per-preset parameters common to all effect types, including EP (Expression Pedal) ON/OFF and EP SET. ***Note – In the current version of Nixie, moving your expression pedal will not update items such as the MIX knob position and the MOD knob position in the Device Editor. To save changes that you have made to your presets while connected to the Nixie Software to your pedal’s memory, just click the WRITE button. To undo this action, click press CTRL/CMD+Z until you reach the desired place in the History pane (usually the Clean state before you clicked the WRITE button), or simply click the Clean state line item in the History pane. Then click the WRITE button. Note that the green check mark in the History pane indicates the state that is currently saved in the device. Green check mark indicates state most recently written to the device. Clean state prior to any changes and prior to writing to device. How do I rename the presets in my Strymon pedal with Nixie? The preset currently being edited will be highlighted in RED in the preset table in the Device Details window on the right side of the application. Double-click on the highlighted preset in the preset table, type in the new name, and press the Enter key. To save these changes to the pedal’s memory, click the WRITE button in the Device Details window. How do I save the changes made in Nixie to my Strymon pedal? To save changes made to the pedal in the Nixie software, just click the WRITE button. How can I use the Preset Collections window in Nixie? The Preset Collections window is located on the left side of the Nixie software and can be used to group together your own custom collections of presets for your Strymon pedals. Nixie has extensive drag and drop functionality, so you can drag individual presets or preset collections from any location on a hard drive, or even directly from a web page, into the Preset Collections window. Click the arrow to the right of any preset collection to show or hide its contents. Click twice on a preset collection to make its name editable (if you wish to rename it). ***NOTE: The current version of Nixie does not have History or Undo for the Preset Collections pane. Deleting preset collections from the Preset Collections pane is permanent. This will not, however, affect backups. Click on any preset in the Preset Table and then select them with all with CTRL/CMD+A. Right-click anywhere in the Preset Table and select Create Collection from the pop-up menu, OR..
Click and hold anywhere in the Preset Table, then drag into the Preset Collections window. Click twice on the new preset collection to make the name editable (if you wish to rename it). Select the presets you wish to include from the Preset Table. Right-Click within the selection in the Preset Table and select Create Collection from the pop-up menu, OR..
Click and hold any of the selected presets, and then drag into the Preset Collections window. How do I assign parameters to control with my expression pedal in Nixie? In the Common tab of the Device Editor for each preset, there are SET HEEL and SET TOE buttons that are used for assigning an expression pedal to control selected knobs on your Strymon pedal. Press ‘SET HEEL,’ then, turn the knobs you would like to control to the position you would like when the expression pedal is in the HEEL position. Then, press ‘SET TOE‘ and turn the same knobs you would like to control to the position you would like when the expression pedal is in the TOE position. When you are done making these assignments, save these changes to your preset by pressing the WRITE button in the Device Details window. How do I assign the PARAM1 and PARAM2 knobs for BigSky and Mobius in Nixie? Click the Parameter Assign button (down arrow button under the PARAM1 and PARAM2 knobs) under the PARAM knob you wish to assign to a parameter in the EFFECTS tab at the bottom of the GUI. The Parameter Assign button will illuminate to indicate that it is ready to be assigned. In the EFFECTS tab below, adjust the parameter that you wish to control. This parameter will now be marked P1 or P2, depending on which PARAM knob is being assigned, and the Parameter Assign button will go dark to indicate that the PARAM knob has been assigned. Can I access the GLOBLS menu of my pedals with Nixie? Currently, Global Parameters are adjusted within the pedal, and are not directly accessible within Nixie. However, Global Parameter values are backed up, read from, and written to the device by Nixie. Why doesn't Nixie see my connected pedal? If your Strymon pedal is NOT detected by Nixie, the Device Details window will provide you with options to help with getting your pedals connected to Nixie. Click the Detect Hardware button in the Device Details window (or select Detect Devices from the Device menu) to rescan your MIDI ports for any connected Strymon pedals. If your connected pedal is still not recognized, click the View MIDI Adapter List button to show all of your computer’s available MIDI Input and MIDI Output ports. If your MIDI interface does not appear, make sure that it is connected to your computer and any necessary software drivers for the interface have been installed from the manufacturer’s website. Make sure to check that your MIDI connections are correct. For most MIDI interfaces, the MIDI IN port connects to MIDI OUT and the MIDI OUT port connects to MIDI IN. For some MIDI interfaces (like the Roland UM-ONE), the cable ends tell you where to connect them. For example, ‘To MIDI IN’ connects to MIDI IN and and ‘TO MIDI OUT’ connects to MIDI OUT. ***NOTE: Clicking Detect Devices or Detect Hardware will erase all items from the History window for all currently connected pedals. An Auto Save for each pedal will be automatically created in the Preset Collections window. The Auto Save includes all changes that have not yet been written to the device, but will not include the undo history. If Nixie recognizes your connected TimeLine, BigSky, or Mobius pedal, but fails to complete the firmware update, there may be older firmware on the pedal that is preventing the update to complete. In this case, you can manually send the firmware to these pedals using 3rd party software to complete the update. Below are links for downloading a zipped file that contains the firmware file along with instructions on how to perform the update on these pedals using 3rd party software. How can I get help with the Strymon Nixie software? Your computer make and model. Your computer operating system version. Version of Nixie you are using (found in About Strymon Nixie). MIDI Interface make and model. Details on how your pedals are connected to your computer. Details on what you experienced and any steps you take to reproduce the issue.